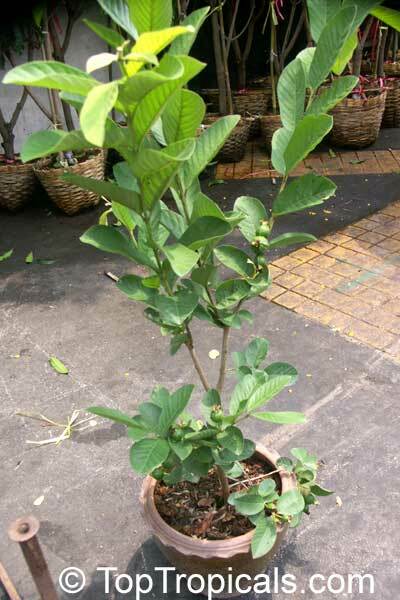 Brazilian Guava, Araca Pera, Bayabas. 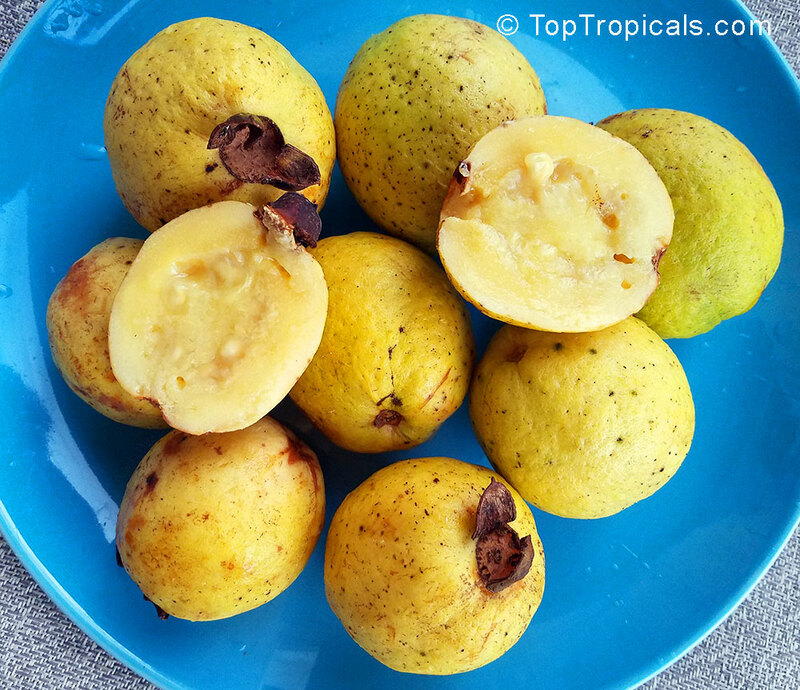 An unusual and tasty wild guava from the Brazilian Amazon. Rare in cultivation. 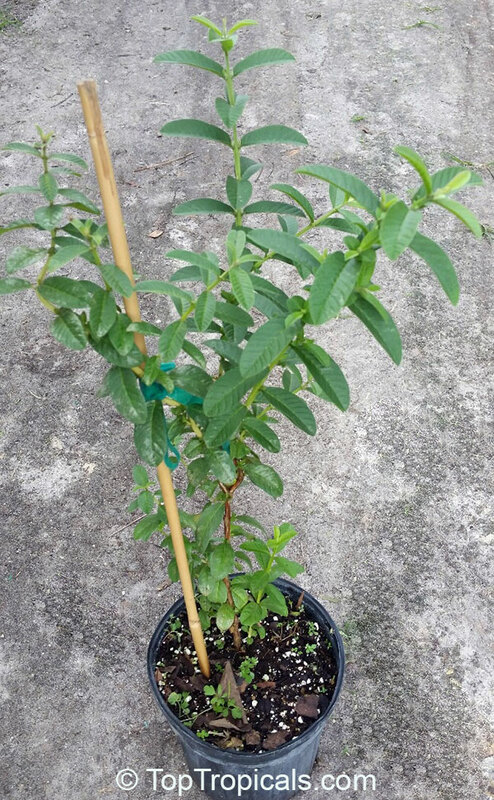 Grows into a small tree, leaves are very interesting and distinctive, with wavy margins. Fruit grow to 2-3", with an acidic, sour but guava-like flavor. Its juice is concentrated and must be diluted and sweetened to produce a delicious drink. The fruit is processed into ice cream sorbet, gelatins and candies. A great container specimen. Zones 9 to 11. 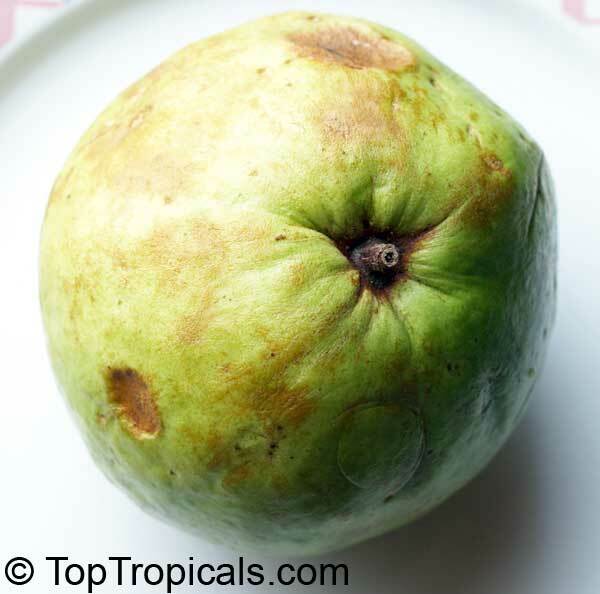 Costa Rican Guava, Cas Guava. Yellow fruit, 1-3" around, similar to the common guava but often very acidic. 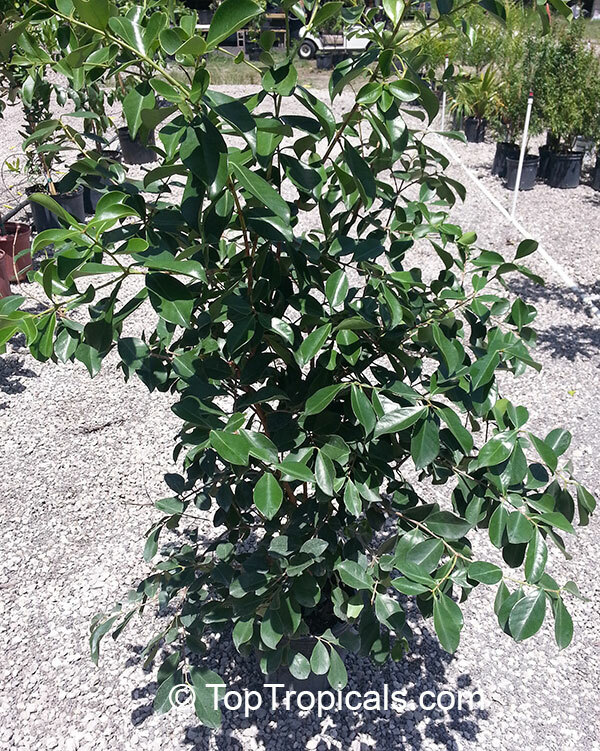 Growth habit is similar to the regular cattley guava. The cas guava is sometimes thought to be not as hardy as the tropical guava however mature trees seem capable of withstanding short frosts. Usually used to make jams, jellies, and preserves, or as a flavoring for drinks. The fruit is very acidic so it is generally not eaten fresh out of hand. Costa Rican Guava, Cas Guava. Delicious flavorful fruit, sub-acid, great for drinks of eating out of hand for those who like sweet-n-sour fruit. Lots of vitamin C. Seeds germinate readily and seedlings grow fast. 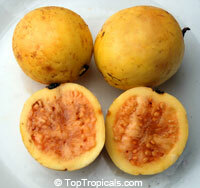 The yellow fruit, 2-3" around, similar to the common guava growth habit is similar to the cattley guava. Mature trees seem capable of withstanding short frosts. Usually used to make jams, jellies, and preserves, or as a flavoring for drinks. Tropical Barbie Pink. Considered by many to be one of the best guavas for the home garden. 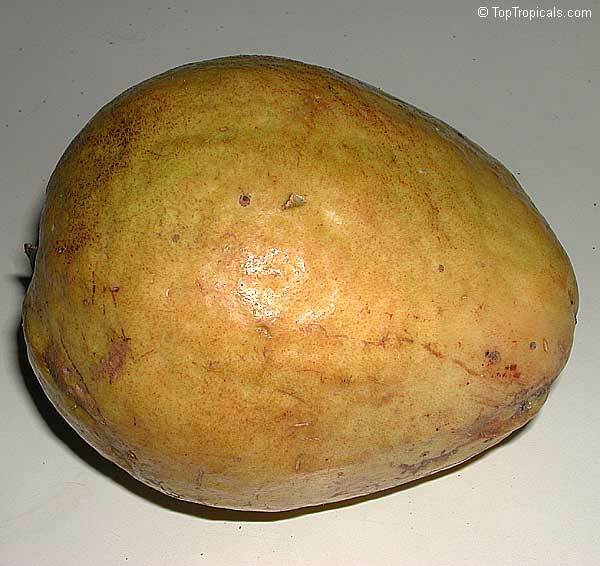 This highly productive cultivar produces pear-shaped, yellow skinned guavas with thick, pink flesh. Lower in pectin than other varieties, this variety is superior for eating out-of-hand or processing into juice. In spite of its common name, the tree is cold hardy for a tropical fruit. Very reliable, heavy producer. Will fruit in container. Ruby Supreme and Barbie Pink guava are very similar, but Barbie pink is much larger and not as dark of a pink color. See photo of fruiting plant in container. Tropical Guava Ruby Supreme. 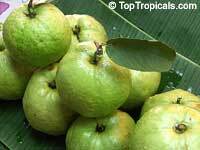 Considered by many to be one of the best guavas for the home garden. 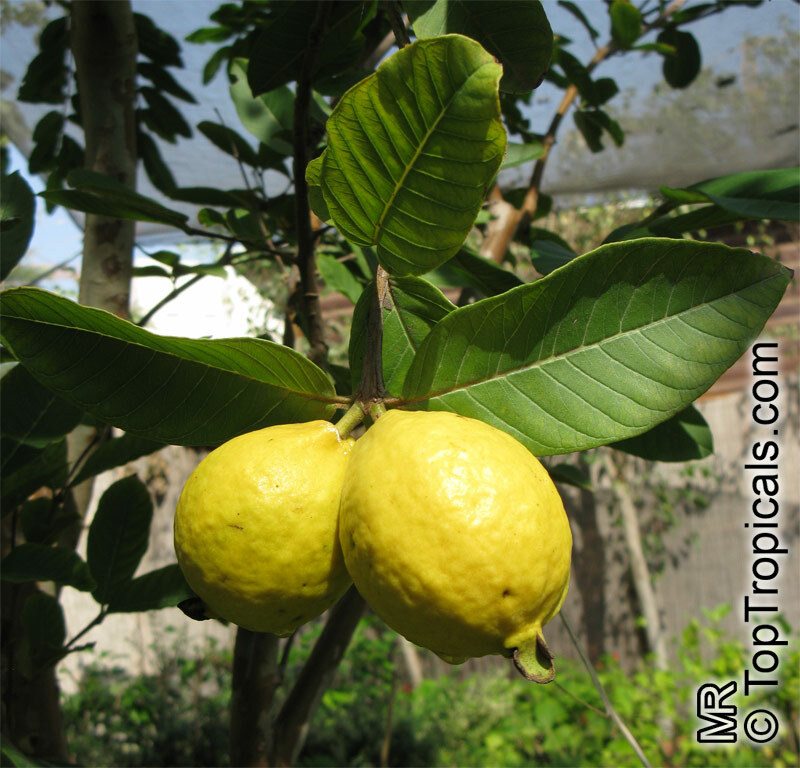 This highly productive cultivar produces pear-shaped, yellow skinned guavas with thick, pink flesh. Lower in pectin than other varieties, this variety is superior for eating out-of-hand or processing into juice. In spite of its common name, the tree is cold hardy for a tropical fruit. Very reliable, heavy producer. Will fruit in container. 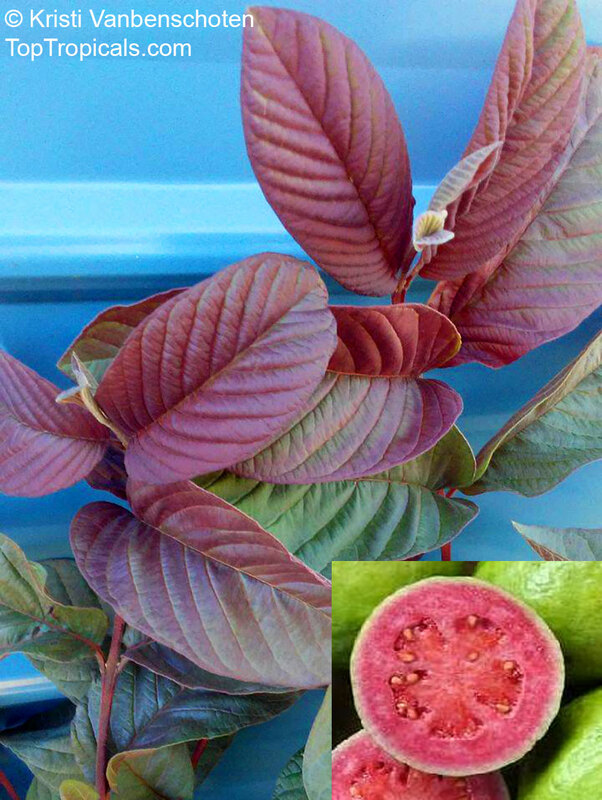 This is a new unique variety with bright red fruit pulp, green outside when the fruit ripens. 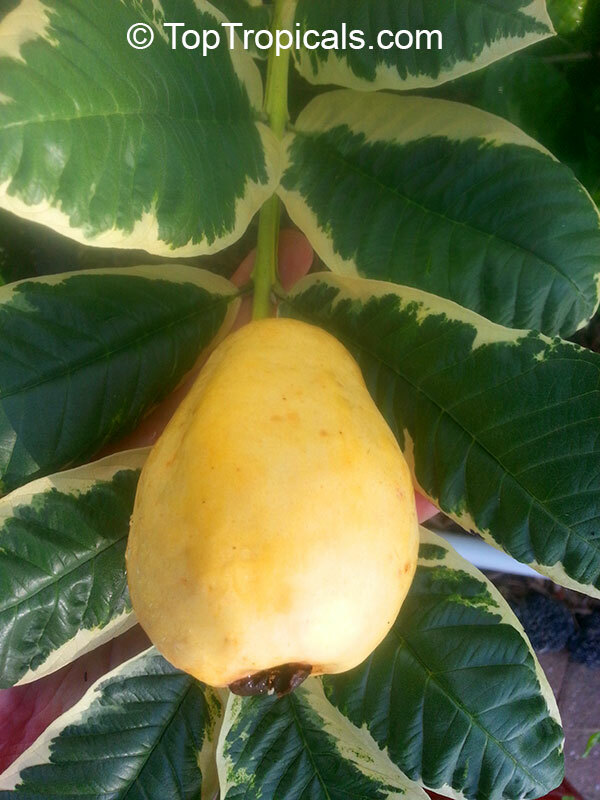 It is super sweet, and has very few seeds that separate easily from the fruit. Fruit is round shape and medium size. The tree has a moderate growth rate. This variety is highly resistant to fruit flies and worms. This variety is originated from Ruby supreme and is called 10-30. It is sweet with no or very little tartness and most importantly "worm resistant". 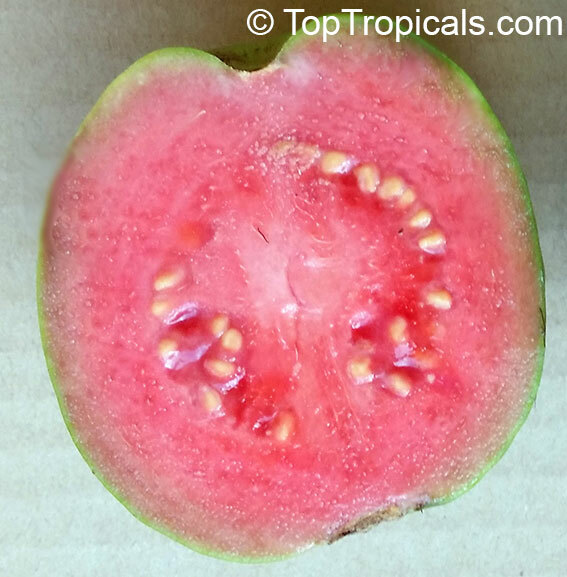 The 10-30 ruby supreme guava has a thicker skin, which prohibits the fruit fly from penetrating it and laying it's eggs, which turns into larvae (worms). Tropical Guava - Guava Viet Nam. 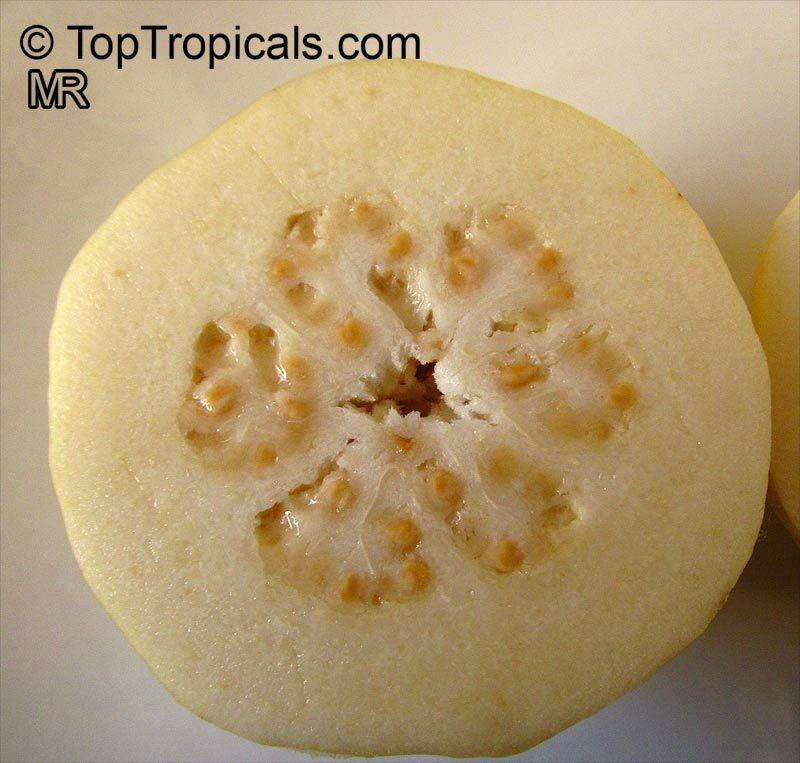 Rare variety, white flesh fruit with many small seeds. Crunchy fruit has an excellent sweet flavor; it is round in shape, and can grow up to 6in. The plant can be trimmed to be kept small to grow in pot. 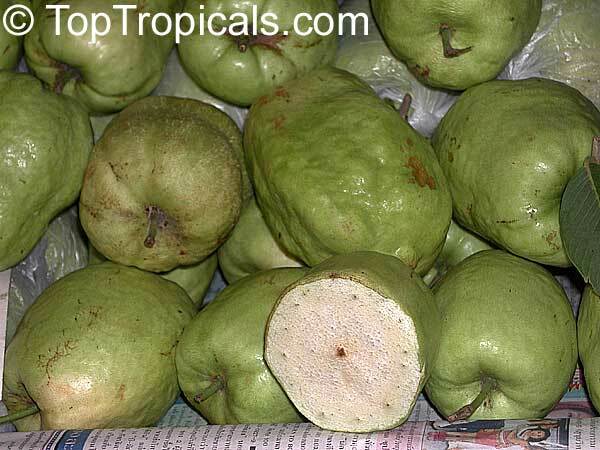 Rare variety of Tropical Guava from Indonesia. Round fruit with white flesh. 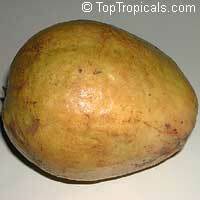 Kilo White Guava. The fruit is very large (up to a kilogramm, hence the variety name), round, contains few seeds, and has soft white flesh when ripe. Guava is a good tropical fruit tree not fussy on the soil quality, and produces fruit year after year. It is relatively cold hardy. Requires regular watering. Great container plant, will fruit in a pot in small size. 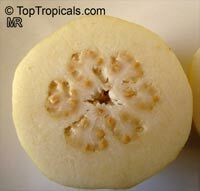 Peruvian White Guava. 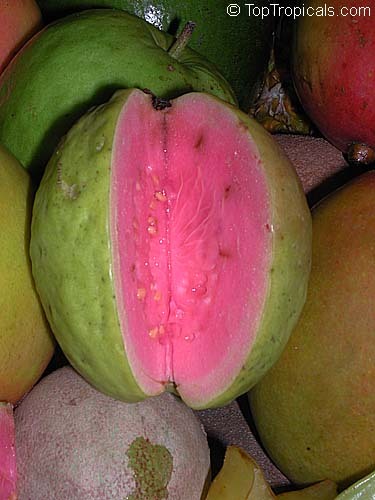 The fruit is large, contains few seeds, and has soft white flesh when ripe. 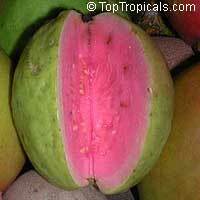 Guava is a good tropical fruit tree not fussy on the soil quality, and produces fruit year after year. It is relatively cold hardy. Requires regular watering. Great container plant, will fruit in a pot in small size. This is a new unique variety with dark red leaves and bright red fruit pulp. It is super sweet, and has very few seeds that separate easily from the fruit. Fruit is round shape and medium size. The tree has a moderate growth rate. This variety is highly resistant to fruit flies and worms. Thai White Guava. It is a large, crunchy guava containing few seeds. 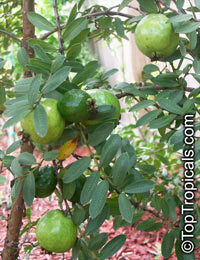 Guava is a good tropical fruit tree not fussy on the soil quality, and produces fruit year after year. It is relatively cold hardy. Requires regular watering. Great container plant, will fruit in a pot in small size. 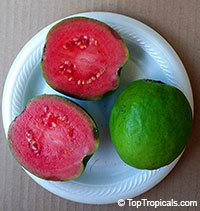 Tikal Guava is an excellent cultivar with large yellow-skinned fruit (about the size of a baseball) and sweet, pink flesh. 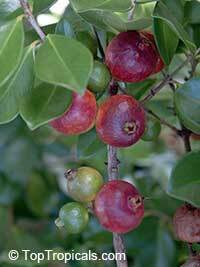 The tree is very compact and fruits on and off year-round and may begin fruiting at a young age. The more sun and warmth they receive, the more fruit they will produce. Tikal is an early bloomer and it makes a fine subject for containers where it can be easily maintained between 6 - 8 ft tall. This pest-and disease-resistant fruit is a great selection for the beginning fruit gardener. 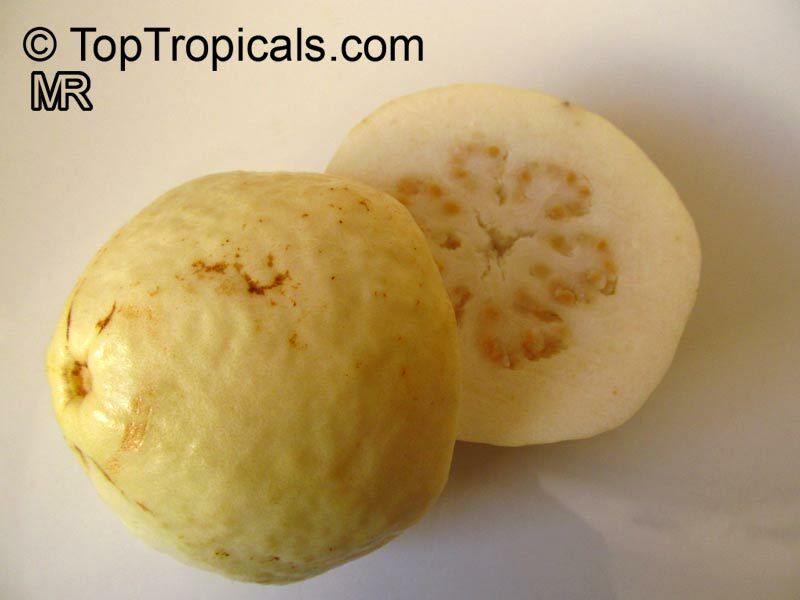 Tropical Guava, White Cuban Guava. Rare variety, white flesh fruit. 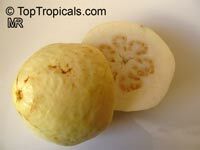 Guava is a good tropical fruit tree not fussy on the soil quality, and produces fruit year after year. It is relatively cold hardy. Requires regular watering. Great container plant, will fruit in a pot in small size. The fruit is very large (up to a kilogramm, hence the variety name), round, contains few seeds, and has soft white flesh when ripe. 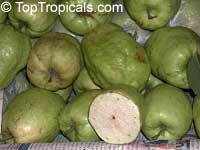 Guava is a good tropical fruit tree not fussy on the soil quality, and produces fruit year after year. It is relatively cold hardy. Requires regular watering. Great container plant, will fruit in a pot in small size. This is a very small, dwarf version of the Guava. 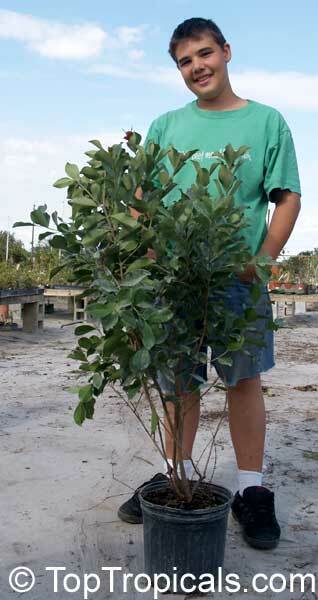 The tree grows only up to 5-6 ft tall with a short trunk and branching habit. Leaves are narrow and 2 inch long. This plant has many advantages for those who have limited space. It can be grown in a pot and fruits heavily. Blooms mostly from fall through spring, although the tree can bear fruit almost year around. The fruit is round, and almost a full size, 2 inch size, surprisingly for the dwarf habit of the plant. See picture of 1 gal plants. 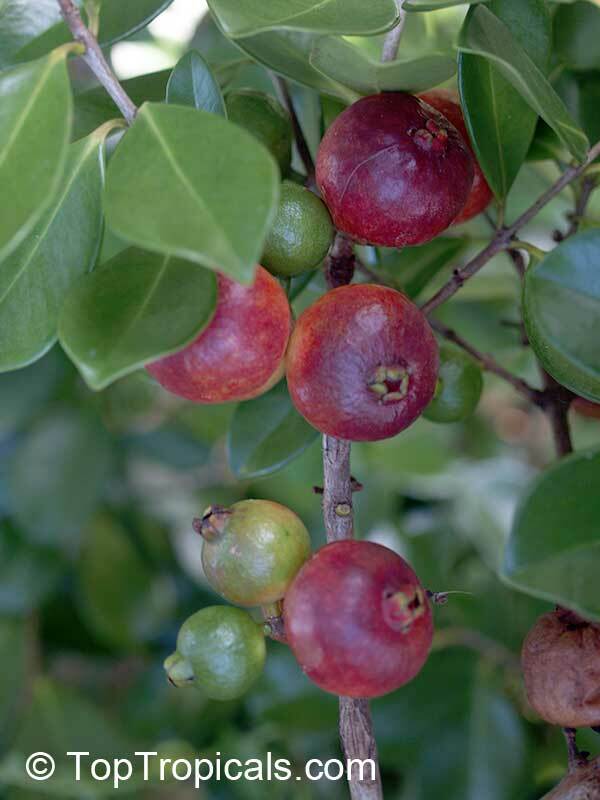 Thai guava is a large size fruit variety, 4-6" in diameter, with super sweet red pulp and very few seeds, located close to the center of the fruit. Fruit with a yellow skin, oval in shape. HoneyMoon - Unique variegated guava with the sweetest fruit we ever tasted. Fruit is medium size, pear-shaped, variegated (white/green striped) outside when unripe, turning bright yellow when ripe. 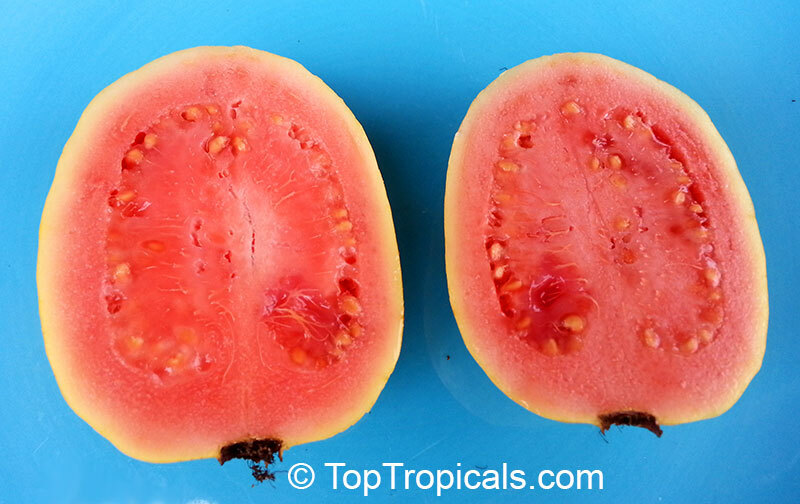 The flesh is pink, very aromatic, sweet and delicious, and contains only a few seeds that separate from pulp easily. This variety is resistant to insects and worms. The fruit is excellent and highly aromatic. Bushy shape, very full tree with large, broad, variegated leaves. Surprisingly for a variegated form, it is very healthy, strong, vigorous and fasts growing. The plant flowers and fruits in small size, perfect for containers. If planted in the ground, the tree grows small to medium size (10-15 ft) with has nice, symmetrical bushy shape. Everbearing, very reliable producer, the plant constantly has fruit, buds or flowers. These are air-layers. HoneyMoon - Unique variegated guava with the sweetest fruit we ever tasted. Fruit is medium size, pear-shaped, variegated (white/green striped) outside when unripe, turning bright yellow when ripe. 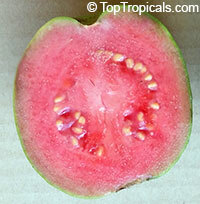 The flesh is pink, very aromatic, sweet and delicious, and contains only a few seeds that separate from pulp easily. This variety is resistant to insects and worms. The fruit is excellent and highly aromatic. Bushy shape, very full tree with large, broad, variegated leaves. Surprisingly for a variegated form, it is very healthy, strong, vigorous and fasts growing. The plant flowers and fruits in small size, perfect for containers. If planted in the ground, the tree grows small to medium size (10-15 ft) with has nice, symmetrical bushy shape. Everbearing, very reliable producer, the plant constantly has fruit, buds or flowers. Seeds germinate readily but small seedlings are very sensitive especially to over watering. Albino seedlings are common. 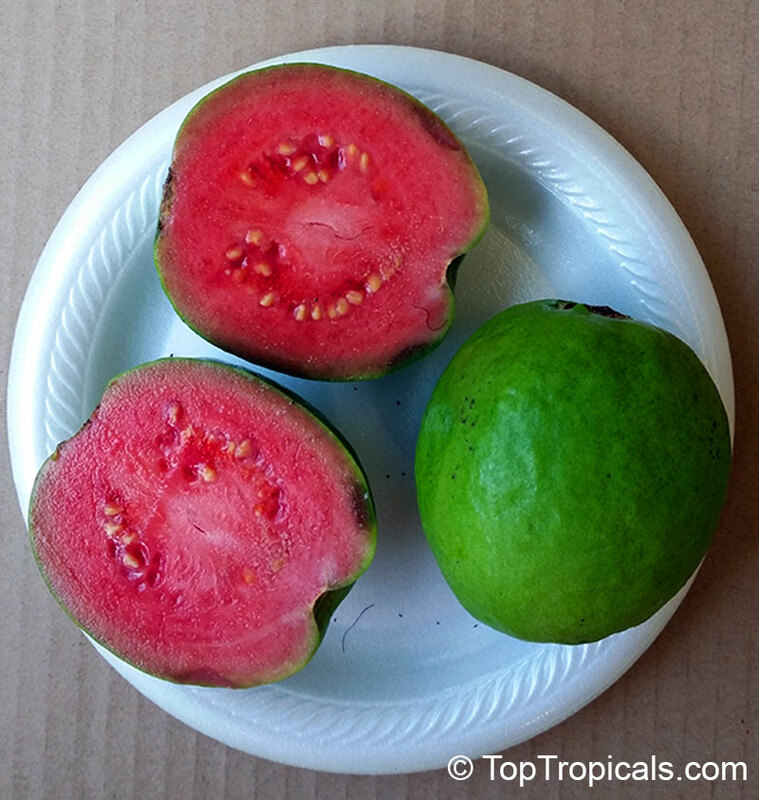 Guyana Guava. Pear shape fruit with pink flesh. 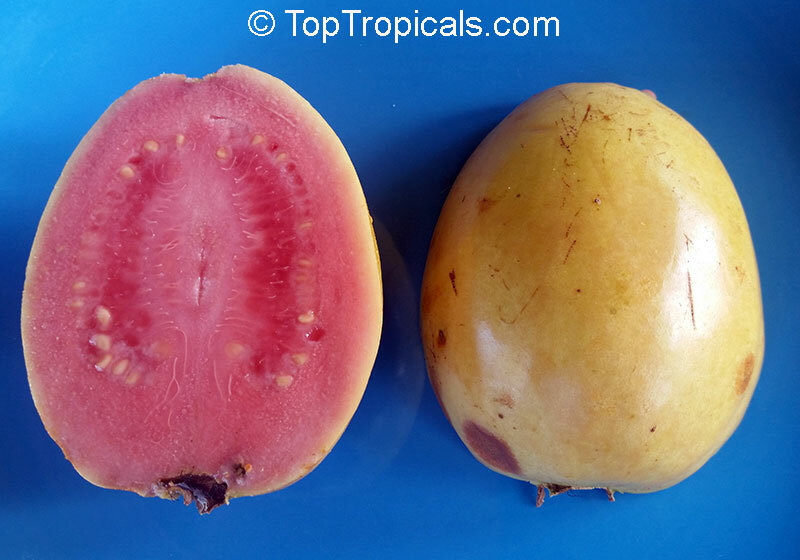 Rare variety of Tropical Guava. Plant seeds 1/2" deep in well draining potting mix, keep warm, damp and in bright light. 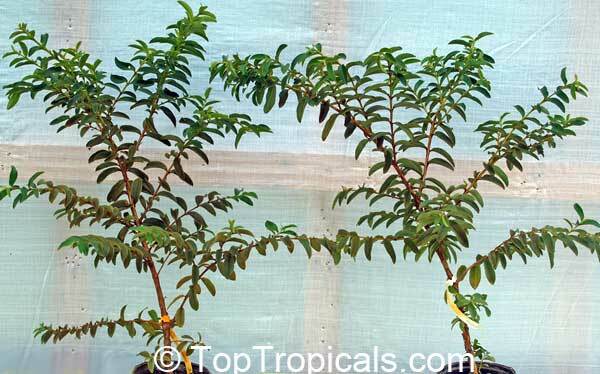 Cattley guava - Fast growing, fruits easily in container, cold hardy, tolerates alkaline and poor soils. Cattley guava, red fruit. Fast growing, fruits on 2-3d year. Cold hardy, tolerates alkaline and poor soils.